Drama International Short Film Festival is Greece's leading short film festival and the annual meeting place for filmmakers and industry professionals. Based in the city of Drama the festival is the main Greek and South-Eastern European gateway to the world's most prestigious short film awards, and nominated filmmakers qualify for the European Film Awards. 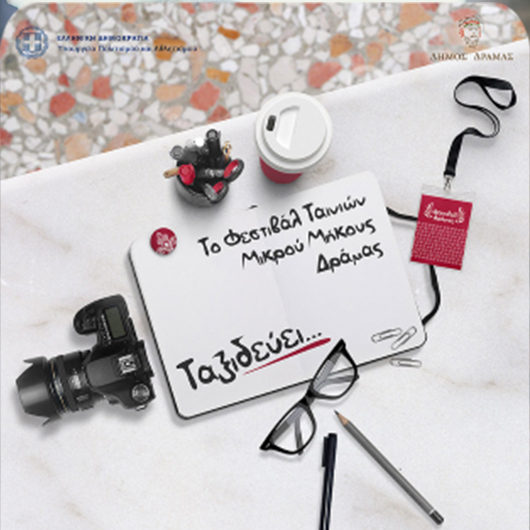 For more than 17 years the awarded short films of the Drama International Short Film Festival have been travelling to meet the cinephile audience in different cities in Greece and abroad. Germany, Egypt, Cyprus, Serbia, Italy together with more than 60 Greek cities have been few of the destinations that welcomed this initiative. We are proud to add Ireland as a new destination to this film journey. Synopsis: The unexpected encounter of two strangers and their agreement while waiting for a cab to share the cost of the ride, becomes the motive for the anatomy of a relationship. Synopsis: : We follow the course of a ticket for public transportation as it passes from hand to hand. Each person that holds the ticket carries his own story and a social problem as well. This reflects a social recording of the Greek crisis. Synopsis: Tassos, a man just over 50 years old, with a career in the marketing and commercial direction of large corporations, has been unemployed for three years now. Too old for a new beginning, but also too young to resign. His relationships with his close people are being tested, and his psychological state is marginal. His goal is one: to get out of the 'freezer'. Synopsis: Most adults dream of staying forever young, living life as a game, free from social rules and limitations. Five employees in a small business will try to make this dream a reality. What they discover is that you may escape the rules, but not the consequences of your actions and your personal responsibility for them. Synopsis: A woman is admitted to a private clinic under extremely awkward circumstances. When the need of a blood test arises, the horrific truth of her private life is revealed. Sometimes a glamourous façade can hide the worst abuse. © 2018 Dublin Greek Film Festival. All rights reserved.